Small business owners in Liverpool city centre say they are suffering from an “epidemic” of break-ins. The latest incident saw thieves smash their way into the Dale Street Eatery – the second time the business has been hit within a week. Two doors down, the Dead Crafty Beer Company is also currently sporting a boarded up window after its latest break-in on March 25. The bar and beer shop has only been operating in Dale Street for a year but has been broken into four times already. Owner Gareth Morgan said independent traders in the city centre feel vulnerable and under constant threat. He said: “I’m not planning on replacing this window anytime soon – there is just no point because I can’t afford to pay another £1,000 the next time it happens, I think it is actually more secure with the boards up. 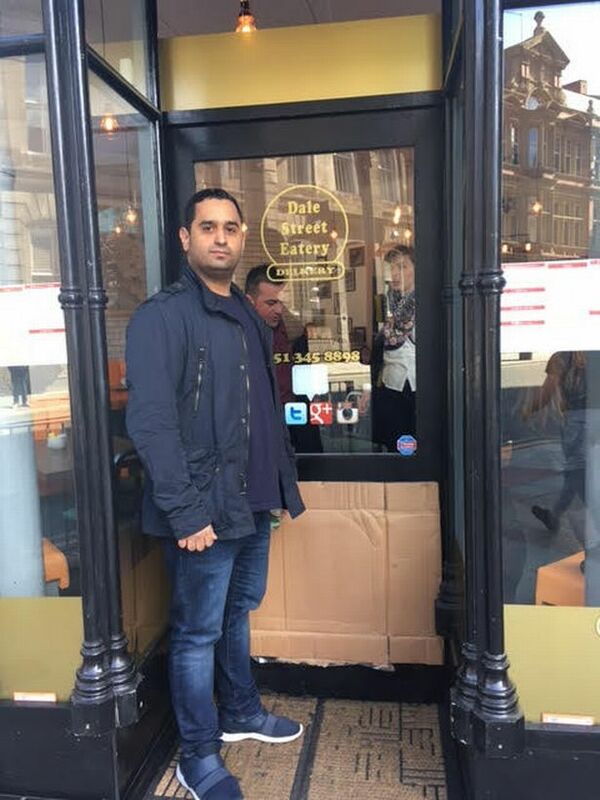 Tariq Batayneh runs the Dale Street Eatery with his wife Lenka Balkova, he explained what happened in Monday’s incident. He said: “They came in about 10.30, smashed the front door, got in and took all the change from the till, they left then they came back in again. She said: “I understand people don’t want to get involved but I would hope they could go somewhere safe and then call the police, but no one did. “One man actually walked past as these guys were coming out, but just carried on. Ms Balkova added that she had heard of numerous other small businesses close to them being broken into in recent months including Dale Street News, Sound Duke Street and Cow & co cafe in Cleveland Square. The targeting of small businesses is a concern for city centre councillor Nick Small – who has asked for an urgent meeting to take place. He said: “I’m very concerned at what appears to be small independent business in the City Centre being targeted by burglars. “I’m calling for a meeting with the police, the Business Improvement District, Chamber of Commerce and small independent businesses themselves so we can share intelligence about what’s going on. “For instance, are these burglaries orchestrated or opportunistic and do we think it’s the same people responsible. City Centre Community Inspector Steve Hardy said: “We have received reports of a number of burglaries at commercial premises in the city centre in recent weeks. “Business burglaries are not victimless crimes, many of these businesses are local people who just want to earn a living. “Our officers have provided support to those businesses who have been victims of burglaries and are visiting business premises in the city centre this week, speaking with business owners and offering crime prevention advice. Anyone with information is asked to contact Merseyside Police on 101 or Crimestoppers on 0800 555 111.